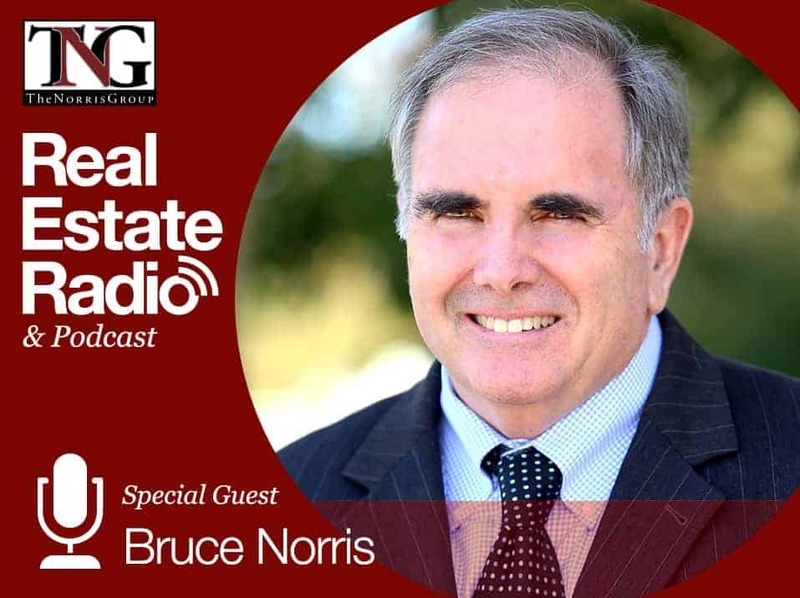 Aaron Norris is joined this week by his dad and president of The Norris Group, Bruce Norris. These next two weeks will be a little different in that they are covering the webinar from December 18 that discusses their latest TNG Economic Update Newsletter and upcoming event California Real Estate: On Borrowed Time. It is typically only a part of their VIP subscription. But, to celebrate this upcoming market timing report, they decided to open it up to their entire network. You can watch and listen to the entire thing uncut at www.thenorrisgroup.com/ticktock. Here, you will also find information about the event coming up on January 26. What are some changes currently happening in the lending world? How was commercial real estate funded differently this time compared to before? Who is the leader in exiting domestic migration? What are the many different topics Bruce will cover at California Real Estate: On Borrowed Time? How does the market in 2018 feel compared to past markets? Should you get out ASAP if you own land on which you do not plan to build anything? Could we see a lot of people walking away as things start to decline? Bruce Norris continues by discussing the different topics he will be covering in January’s market timing report. There are a lot of things happening in the lending world, especially with what they can say yes to and what the buyer can qualify. There are things that have changed, insurance being one. Bruce said part of his family just signed up for insurance that totaled $900 a month. This takes $10,800 out of their budget, and they have a $15,000 deductible. This is almost not having insurance. Some of these things are subliminal that take away affordability because you have to consider what you have to pay. The lending world does not consider insurance payments in the same world as they do car payments. This is a monthly expense, and it is getting big compared to other things. His timing report will look at affordability, what we have left, and what might be affected. What if you have a lending policy that says you have to have an 800 FICO score to get a loan. In the past, it would not be valid to say you are going back to 17%. Bruce will also talk about sales and inventory. Bruce will talk about how common it is that sales are declining as well as the mix of inventory. This always tells you how healthy it is and how close you are to having a downturn. He will talk about the lending industries and where they are currently. He will also talk about the programs coming out and where they are getting to be more aggressive to where you might have some of the same thing. He will also discuss interest rates and some of the Fed changes. Now the Fed will come to a decision here. It is very interesting the things being said. In October, the Fed fund chief basically said we are moving to get to a midpoint for interest rates but are nowhere close to it. That was back in October. Now, we are in December and it is a coin flip whether they will make a rate change (UPDATE: They did increase the rates as of December 19). This was how things had deteriorated. You have the Stock Market going down 500 points every other day. When the rates went up, the game is likely going to change. This is a real important factor going forward since they already changed both the payment and affordability. If you take a look at the historical numbers regarding employment and where it is coming from and not coming from, this is important. When you look at trustee sales, not just in California but per county, the ratios can change very enormously. If you start having a shift in people’s ability to make payments, a lot of unemployment, and a lot of migration out, that can change. However, there is a ratio Bruce would get concerned about if he sees that. Right now there is almost nothing. Another thing you could see in the news is trustee sales going up 100%. That means there are four of them instead of two. Another topic Bruce will cover is the construction of new homes and condos, specifically the historical numbers. He will also look at commercial real estate. It has had a nice run, and this is one category that seems overpriced. If you own an apartment building, you have to be pretty excited about what happened to your valuations. You may love it and keep it forever. If you bought it hoping it would go up, it did. Bruce said if it is in a lousy location, he would not own it anymore. One other thing that is really important is how commercial real estate was financed this time. This also includes loans for businesses and ones that build buildings and take risks. They got financed very differently, and one of the chapters deals with this. He will also look at family budgets and debt gross. He will look at three phases of people’s lives: when they have kids, when they don’t. He will also cover what the difference would be if they lived in San Francisco or Fresno, specifically the necessary income. He will also take a look at prices and what real estate takes out of their monthly budget. Demographics and migration shifts will also be covered. California is the leading exiter of domestic migration at this point. Apparently this will not dissipate. We are having this in the middle of good economic times when people are leaving. He will also cover retired readiness and senior financial stability. This is very important to the concept of not being able to pay the retirement anymore. This is not going to fly. The median senior is heavily reliant on Social Security, Medicare, and whatever they have in their retirement. This will be a very difficult thing to change. He will also look at national debt and other broken promises. Just look at the numbers and where the trajectory is headed. The problem with this is our national debt is locked and loaded as well as the promised path. The only place the budget has some room is discretionary spending. This applies to military. It keeps going down as a percentage and you have to be really careful. He has discussed presidential outcomes before and will cover it again. We have some more additional years. When they took a look at this last time, they said they were overdue for a recession. He should not have bought into that since he hears that a lot with real estate statistics. It has nothing to do with time, but a maturing of charts. It is an interesting thing because in the first two years, President Trump enjoyed a Republican Congress. This is not very normal. Now he doesn’t, which is interesting and important to real estate. California being majority Democrat now is also a big deal, and Bruce plans to interview some people to find out just how big a deal it is. Another topic will be past recessions and the likely cause of the next one. This is a new chapter that takes a look at how a recession gets started. A lot of work went into this one. He will also look along with this how different investment responds to recessions. He took a look at recessions from 1970 on, plugged in gold, Stock Market, and real estate just to see the damaged path. One thing that is interesting is recessions are typically less than a year, and real estate usually does not respond in this timeframe. It gets affected for much longer periods of time. He will look at how prices declined in the past. He will look at all the numbers of the declines, the percentages, and see what could happen. In 2019, we have an alternative ending. California has certainly changed; so they will look at both the end numbers and path that might actually occur. The trajectory will be more painful than he first thought; and we will go down before going back up again. He will also discuss why he went back to Florida and really take a look at the state. He will do an event in the Florida that he will invite people to at the timing event. He will take a look at some of the numbers like median price and all the things they calculated for Florida, similar to California. It is a much more affordable place and safer landing for a downturn. For people who attended Cashing In On A Boom and some of the How To seminars, this report is 250 pages, 400 charts, and Why To. They will not be covering the How To piece at all. What is interesting is sometimes they get the opposite crowd when they only do one or the other. This one is the timing and charts all day. Bruce has read so many technical documents in the last four months to prepare for this. His brain is full, and he was so relieved the night he went to bed and did not have to read another technical document. The remainder of the radio show was opened to people’s questions. If you want more information on the event, you can look at the calendar on www.thenorrisgroup.com. The shortcut is www.thenorrisgroup.com/ticktock. The first question was from Philip Tirone, who asked how 2018 feels compared to past markets. Aaron said it feels different because back in 2008 nobody was talking about it or predicting it. Now there are many people who talk about the fall coming. He wondered if Bruce agrees. Aaron said there is a media train where the sky is falling. Philip worked a lot in lending. When you compare the lending environment in 2006 and 2007 that set up 2008, then compare it to 2016 and 2017, they are two very different piles of loans. He does not think we will have a catastrophe coming from residential financing. One thing covered in one of the later chapters is there are piles of debt that are problematic. However, it is not the residential financing. One of the things Philip and Bruce had a conversation about around 2006 was he knew all the lenders who had done really dangerous loans. They even got together and talked about shorting of the stocks. Around 98% of the loans Fannie Mae has funded over the last six years are fixed and the interest rates are 3-4%. Equity has not been extracted, so Bruce will really take a look at some of the protections in the system that were not there before during his market timing. This does not mean you won’t have a rise in foreclosures or more exiting of migration. It also doesn’t mean it will be a pleasant time. It just does not look like a crash to where we will go from $550,000 to $280,000. However, you do not need to have that damage to feel and be able to say you will step aside and not be part of the damage. This is really what the day is about. Bruce is not trying to scare anyone, but he is letting people know the decisions he would make in 2019 would mimic the decisions he would have liked to have made in 1989. He was not cautious back then and built 7 custom homes thinking it would be business as usual. This was what 1989 was because it was a good year. Unfortunately, it was the last good year. When he finished that product, he paid for that mistake for three years. There will be people who make mistakes in 2019 they will either pay for or step aside and get to safe ground. Typically, in California we have numbers that change. We go from 225% of national price to 160%. This just means one or both of those numbers have to move. This is a big spread, and he does not want to enjoy this sitting on the wrong side of the table. Aaron asked if you should get out ASAP if you own land on which you do not plan to build anything. Bruce said he thought about that and passed three tracts of custom home lots developed in 2005. This is almost 2019, and there is only one new home being built and 80 custom home lots that went for $600,000 at the peak 13 years ago. They still don’t pencil. It was euphoria and very expensive at the peak of the last market. Bruce wished he had asked him this question a year ago since this is not the difficulty. One of the things they will talk about is you can definitely own the wrong inventory that will get damaged much more in price than the median price. This is why he was saying he would like to help people avoid his 1990 when he owned exactly the wrong inventory. You start paying for flaws. His biggest flaw was he was on leased land. His most expensive homes were in Palm Springs, he was on leased land, and he was in a second home area. You have a product at the bottom of the totem pole when we get to Quadrant 1 and 2. Sometimes with land, it pencils to 0 or less. He does not think we are there yet, but there will definitely be people more cautious to buy land in 2019 when they may have been aggressive this year. Brad asked about those who put very minimal down on their home in the last couple years. As it goes backwards, he wondered if we will see a lot of people walking away. Bruce said you will get a certain percentage of those. Even if it is an aggressive percentage, it is such a small percentage of the marketplace. You still had a lot of people putting a lot of money down. If you are talking about a systemic event, you would need $100,000 trustee sales for California to have a big impact on price. Bruce does not think we have that in the cards. You will see people losing their jobs and going into foreclosure along with others who don’t have equity going into foreclosure. These people are different from the last cycle. Even if they did not have a big down payment, they had to have a job and credit. Even with stated income loans they want to see two years of a W2. Aaron knows they started to have a few more aggressive loan programs, but he has not seen them in mass. You have to remember what was in place. Philip Tirone understood how bad the loan products were for years, and they kept getting progressively worse. You do not have a lot of loan programs to end either. You do not have all these tricky loan programs that will end, so people signed up for things. Part of the reason was they knew with confidence they would refi to another program two years later when the payment adjusted to double. However, there is not any other program. Fortunately, there is not that product in place. What is in place is a fixed-rate loan. If you put down 3% and cannot afford to keep it, you will lose it. When the lenders do not get paid, they do not rush out and foreclose. They will make a deal, do a loan mod, or take the property back and do cash in lieu of a foreclosure. They would then give it to someone like Mike Novak-Smith in lieu of a rental. There is a whole new play book in place. Those are the safeguards we have despite the scary parts. Aaron combined two questions regarding Florida. They asked where Bruce sees Florida in the cycle, and he said he is very comfortable with it. This is one reason he is here. He has something called a moodometer, which calculates what percentage of the median income is taken by the median price home. California is 45%, and Florida after a price run is at 24%. The next similar question was if he saw a time in the future when it would be good to sell in Florida and buy in California again. Bruce said this is an interesting question. When that gap closes, like going from $225 to $160, all of a sudden California is the return state. If it takes another run to $225, you might want to take advantage of that. The next question was in regard to multifamily and how Bruce felt about it. He said it is like the Mike Cantu or Tony Alvarez philosophy. It all depends on what your intention was. He liked that Mike Cantu gives the property an assignment: keep forever and send me a check. If that is why you bought the apartment building, this is a different answer. But if you bought it for it to go up, then it has done its job. It will probably be impacted more than single-family housing since you have the cap rates that do not make sense. Speaking in front of an audience of 400 apartment owners, he was asked if we were in a bubble. He responded by asking them one question. He asked them if they would buy their apartment building at its current valuation. There was rolling laughter. This is the definition of a bubble. He basically said no one intelligent would pay this stupid price. However, the question is why they don’t sell it. Bruce bought a finished building lot for $3 grand in Rosamond at the bottom. At the peak, they sold it for $280,000. Tony Alvarez bought one as an REO for $40 or $50 grand. Right now, you probably cannot pencil to build new construction in Rosamond. When that developer created that development, it was in the late 80s. He held onto it, lost it, then the bank held onto it, and the bank went under. Land is scary stuff at the end of Quadrant 4, where we are. Aaron asked Bruce where he feels we are in the Quadrant system. He has not looked at all the math, but it feels like the bottom of the 8th inning. This is why he wrote the report; it’s because there is time. He does not think 2019 is a devastating year. It is an acceptable year to sell. If you look at the inventory of most investors, we get deals on marginal homes and locations. We could fix them up to where they are grand, or we do not. However, when you start paying for anything with flaws after the downturn starts, this becomes unprofitable. The damage becomes much more on that inventory. If you looked at a chart, the 1990s went down very methodically 2% a year. Bruce’s inventory went down 30% the first six months. The dirt in Palm Springs went from $60 grand a lot to nothing. You could not give it away. You could have the wrong inventory. Before ending, another question was whether Bruce would live in any other states if not Florida. He said Texas has the migration of businesses and people. He has been there, and taxes are high and they have had a good price run. He is not an expert on all 50 states, not even Florida, but they are making the effort to do this. He likes Florida for one basic reason: it’s main business is seniors, who need caretakers. Right now, 18% of Florida is over 65 years old. When somebody turns 65, they have two caretakers. By the time they are 85, they have 7. This means 18% of the population is going to drive 350% more caretakers in the next 20 years. This is your renter or buyer, and they make good money and are being asked to come. It is like you having a tech job in San Jose and they are asking you to come. This is what happens in an area like Leesburg. If you are an RN, you are being asked to show up.